You love the mountain and want to discover it in an athletic manner? Your perfect holiday takes place in the wild, and you like breathing the fresh air? Then we at INTERSPORT Rent have exactly what you need. Whether you are looking for sporty bikes, comfy e-bikes, or intend to walk, hike or climb - with our rental equipment, you will always be fitted with the newest models. Our RENTertainers know what they talk about since they come from the region and are enthusiastic sportsmen themselves. This is why they can assist you optimally in your choice of equipment. No matter the adventure you seek, you will receive only the best to meet your needs. Next to a large range of bikes and outdoor equipment, INTERSPORT Rent also offers you a unique Extra Service. Immerse yourself in nature and enjoy your holiday! In our INTERSPORT Rent shops, you can get everything from a single source: it’s quick, convenient and cheap. 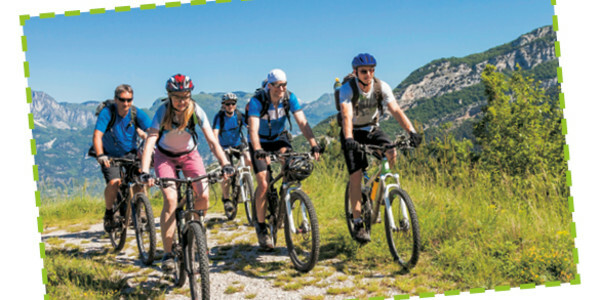 Families, groups, singles or couples alike will find their heart’s desire in our large range of bikes and hiking gear. The quality of the experience increases with the quality of the equipment. Discover the mountains and get your dose of summer! You want to avoid laborious luggage transports? Our advice is to make the reservation online conveniently from home so that you can reach the mountains faster and not lose any precious holiday time.